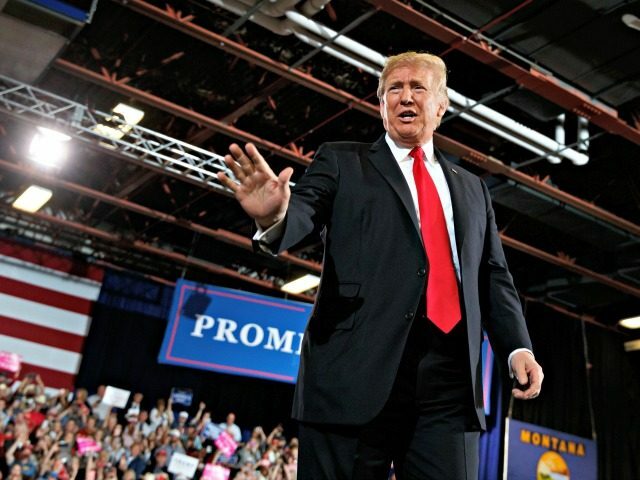 President Donald Trump pledged to protect Immigration and Customs Enforcement (ICE) from the onslaught unleashed against the agency by leftists and their allies in the Democrat Party at his Thursday rally in Great Falls, Montana. The rally was held in part to support Republican Senate candidate Matt Rosendale, who is aiming to unseat Tester in a state Trump won by more than 20 points by running on a strong immigration enforcement platform. So far, Tester, running to retaom such a vulnerable seat, has not joined the growing ranks of Democrats who insist they want to “abolish ICE,” the primary immigration enforcement agency in the country. The concept is deeply unpopular among swing voters, and support has long been reserved to American communists and other far-left groups. However, in the wake of the widespread outrage among the media and political left over a different agency, U.S. Customs and Border Patrol’s detention of accused illegal aliens separately from children with which they were apprehended, mainstream Democrats have joined in the call to abolish ICE. So far, Tester’s fellow Senate Democrats Kirsten Gillibrand (D-NY) and Elizabeth Warren (D-MA), New York City Mayor Bill de Blasio, and a number of Democrat representatives have signed on to the campaign that would effectively end all interior enforcement of American immigration laws, effecting an “open borders” policy.